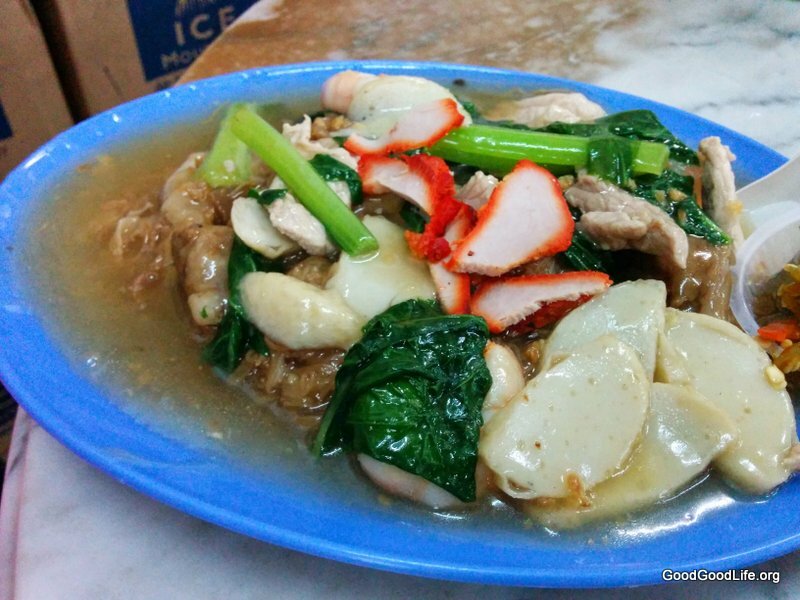 Penang 2014 Day 1 : Part of our Penang series of Articles. Click Here for the rest of the series. Our last stop was the Han Chiang Ancestral Temple. After a long and tiring day of travel and sight seeing, we figured out it was time for great Penang hawker food. We needed to replenish our bodies with some soulful good food. Our next stop was New Lane Hawker Center, a popular place where the local visit for soulful replenishment for decades. New Lane or Lorong Baru was not really a hawker center per say, but actually a street lined with stalls and restaurants. It’s like a food platter of what the gastronomical heaven of Penang had to offer. 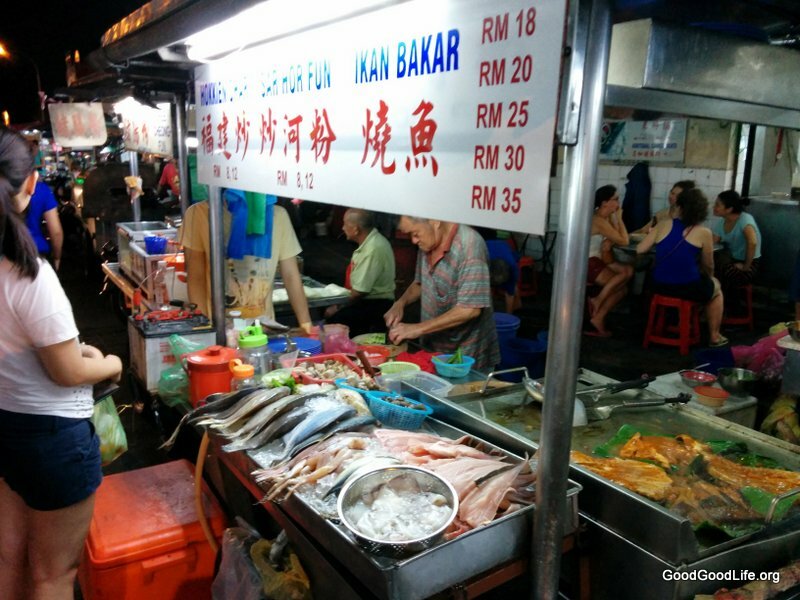 Street food including Char Koay Teow (Fried Koay Teow), Ikan Bakar/Grilled Fish, Oh Jian (Fried Oyster omelette), chicken wing and Teochew Porridge. We walked around and ordered our food and waited at the coffee shop for our orders. 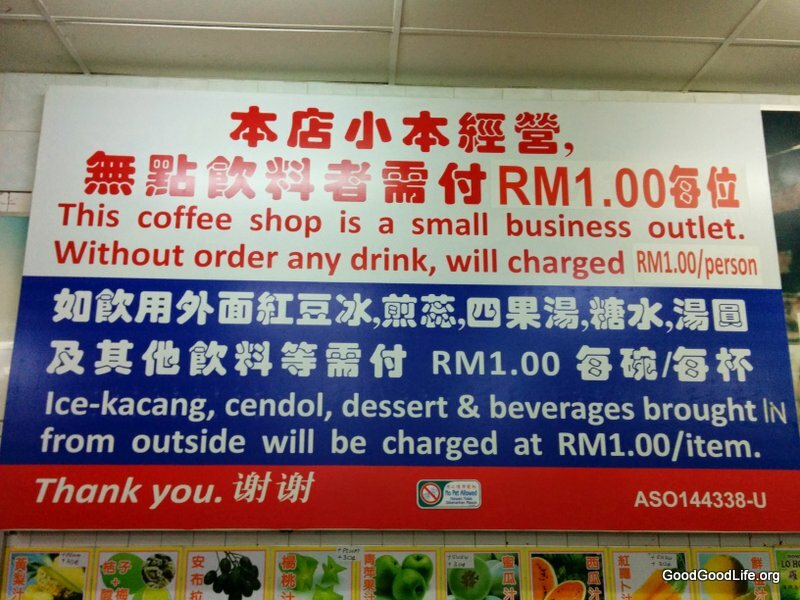 What caught our attention at this coffee shop was a huge signboard with a caveat as follows: We must order a drink or desert… or else we will be charged RM $1.00 per person (??!!??). We didn’t wait too long before our orders arrived. 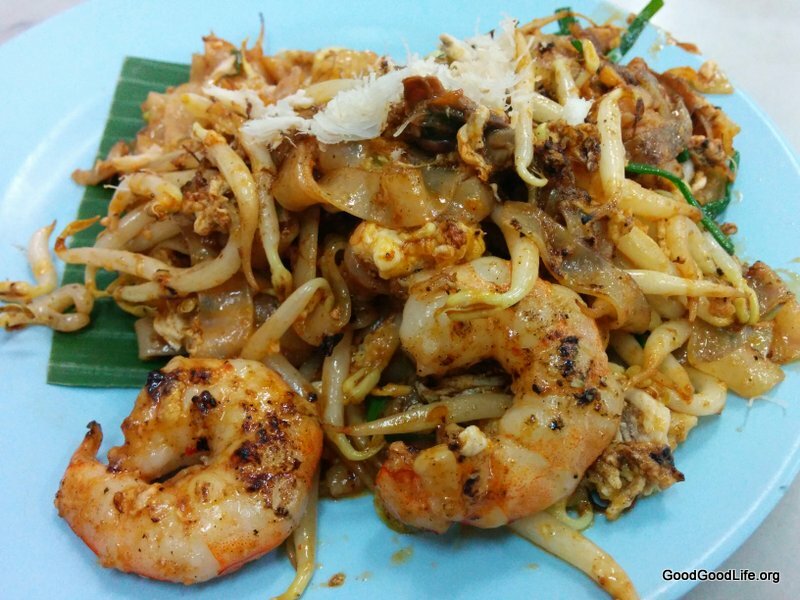 We had the arguably famous Char Kuay Teow of New Lane Hawker Center. 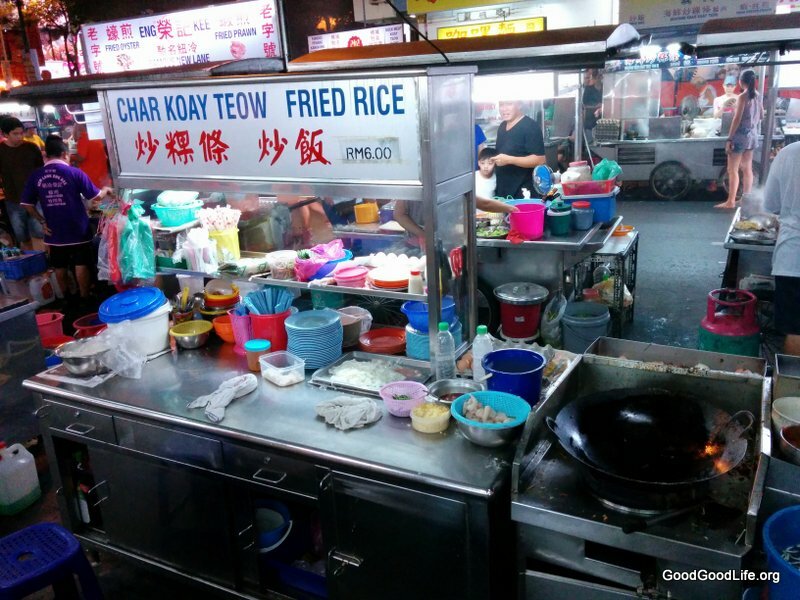 The proprietor had been frying Kuay Teow for decades. I have to say the prawns were big and the dish was topped with crab meat, making it a tasty affair. I would say it was one of the best Char Kuay Teow I have ever tasted. Probably a 8 out of 10 in the Char Quay Teow Scale. Next we had the Penang version of the fried Hor Fun. We order a 1 person portion. But it was actually a 2 person portion by KL standards. You can see from the photo. They are very generous with the meat and vegetable portion. I’m beginning to see that in Penang having extra garnish, meats and vegetable is a standard or perhaps they had now consciously adopted a healthier living by ensure the meals served are well balanced. Next we had the Oh Jian. I was pleasantly surprise by the size of oysters and the generosity of the oysters that was included. The oyster were big and succulent. The egg and batter was fried to perfection. It is probably the best Oh Jian I have ever tasted. We were satisfied with the delicious meal. It wasn’t expensive as we spent around RM25 on food and drinks. It was exciting and refreshing. 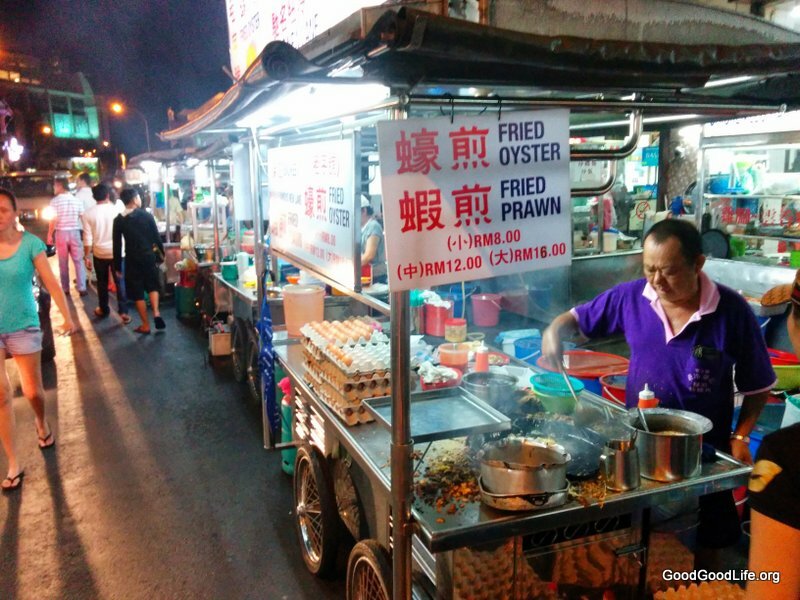 This had set the barometer for us to what good Malaysian Street food should be like. Charged up and refreshed, we want back to our hotel room to rest a bit and got dressed for the next event of the night… The Hennessy Artistry Party at Spice. 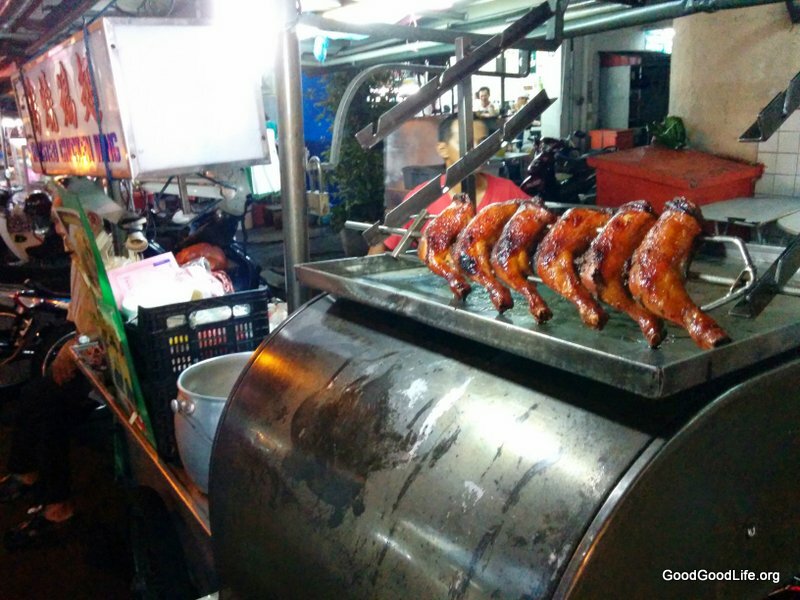 This entry was posted in Food, Travel and tagged hawker, penang, Penang 2014, Penang 2014 Day 1, Penang Series, street food by TheGoodGoodGuy. Bookmark the permalink. First time poster here. Looks awesome. Favourite post on this blog. thank you very much. We appreciate your comment! Please tell us, if you have any good food we should review next. hi I would like to know where is this located? As we will be travel and stay in Evergreen Laurel Hotel. I wonder how can I travel from our hotel to there? How about opearting hours? It is a evening time hawker? You have to take a taxi as it’s too far to walk. Yes it’s a night time hawker street. It’s really worth the visit. As the food is really good. Here is the map link to the new lane hawker center.